We are Law Enforcement Certified Firearms & SWAT Instructors who teach firearm courses on the Florida Concealed Carry Weapons Permit (CCW / CWP), tactical handguns, shotguns, and rifle courses in the Fort Lauderdale area. If you knew you were going to be involved in a gunfight, would you go into it unprepared? Of course, you wouldn’t. You would instead seek out the best techniques and learn them. You would then practice, just like an athlete preparing for a big game. Except this is not a game, this is life or death. Conveniently located just south of Fort Lauderdale, our Law Enforcement Certified South Florida Tactical Firearms Instructors are offering firearms training, gun safety training, Florida concealed weapons permit (CCW / CWP) training, home defense, street survival, self-defense, maritime security & defense, civilian specific courses as well as close range protection. We teach various tactics and techniques to both public and private law enforcement officers as well as teaching tactical training courses for civilians. 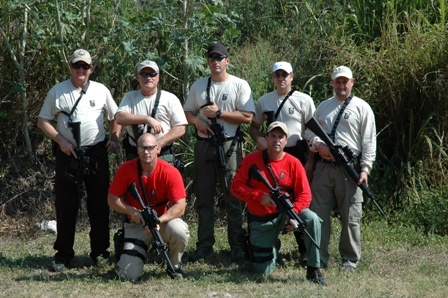 Our experienced instructors consist of both active and former Police SWAT and Military Certified Firearms Instructors. This means we were taught how to teach this information by either the NRA Law Enforcement Activities Division, FDLE or other federal, state and local agencies. All of our instructors are also recognized by the State of Florida as Police Certified. We are confident in our tactical training abilities, because if we can train police officers, we can train you. Is it your Florida Concealed Carry Weapons Permit you desire? Our training course will provide you with the basic handgun training certificate required by the state in order to submit for your Florida Concealed Carry license which has reciprocity in 35 states. We will also help you fill out your application. Additionally, if you care to continue your training we can provide basic to advanced tactical handgun, shotgun and rifle classes as well. See our courses page for more information on our various tactical training courses for civilians. Teaching you to survive the fight is our number one mission. Our interest is making sure you have above–average training and firearm skill development when you finish any of our courses. Other companies only provide their customers with the bare minimum of concealed weapon training necessary to meet the prerequisites for the state permit. You get what you pay for here at Tactical U Firearms Training, because our classes are longer and more intensive than other firearms training courses. We are conveniently located between Fort Lauderdale and Miami, in Hollywood, Florida. It is up to you to practice the firearm handling techniques so that the firearm skills that you learn become second nature or muscle memory. With these skills, you may react to a situation with swift action, rather than having to stop and think. These firearm handling skills and shooting tactics have been proven time and time again to save lives of individuals, potential victims, and bystanders. We can tell you from experience, training pays off every time.